FUN – A great DJ is one of the most important things to make your wedding or party to be fun. EXPERIENCE – More than 20 years experience - Weddings, Bar & Bat Mitzvahs, Sweet 16s, Anniversary Parties, Birthday Parties, Corporate parties, Corporate Events, High School Dances & Proms, and night clubs. MIC SKILLS– Your introductions and announcements matter. We will get them right. 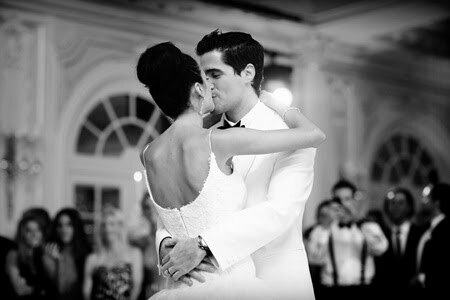 MUSIC KNOWLEDGE – Any wedding veteran knows that the first dance tune is key to the bride and groom, but it’s the music that comes after that determines if a party will be a bust or a blast. I have collected music my whole life and add to my collection all the time. This is important because every bride and groom wants their music played at their wedding and I can deliver regardless of what decade your music is from or what style the music is. LIGHTING – We offer both dance floor lighting and perimeter uplighting. Lighting transforms the room and puts your party into high gear. Click on the Uplighting button above to see pictures from one event. EQUIPMENT – We bring backup equipment to every event. Our systems are State of the art - custom built all-digital equipment and high fidelity sound systems. SERVICES - We provide DJ services, lights, video for weddings, parties, and corporate events..